OK guys, this cake. OMG this cake. 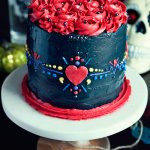 I’m not normally a cake decorator, but I really wanted to make this Dia De Los Muertos cake something special. 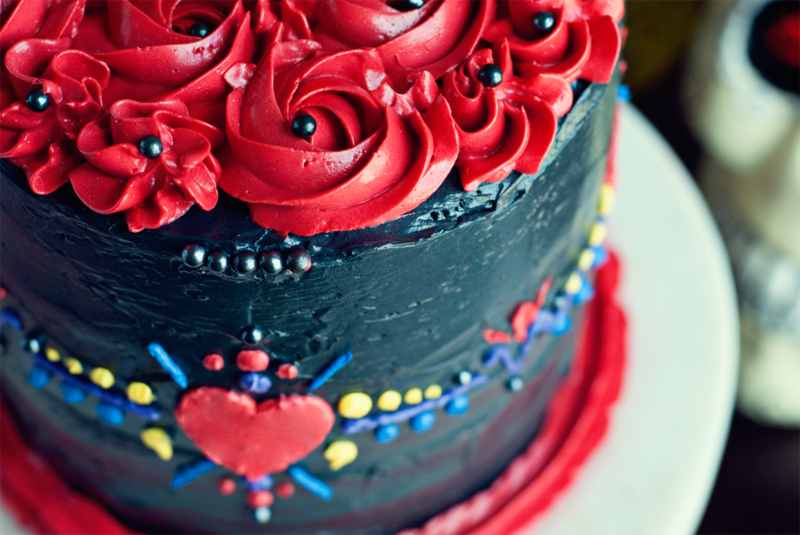 And honestly, I am amazed at how well I did, using my swiss meringue buttercream for those delicate details. I will admit, however, that it took me forever to do. 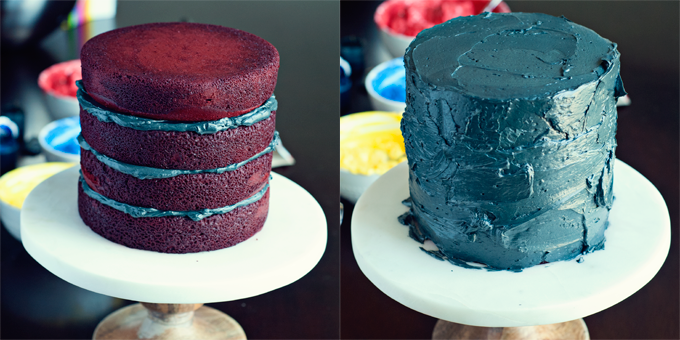 Next time, I think I will work with a different type of icing for that style of decorating. Fo realz. But in the meantime, I am loving this cake, which is perfect for your Halloween baking, bee tee double-yew. 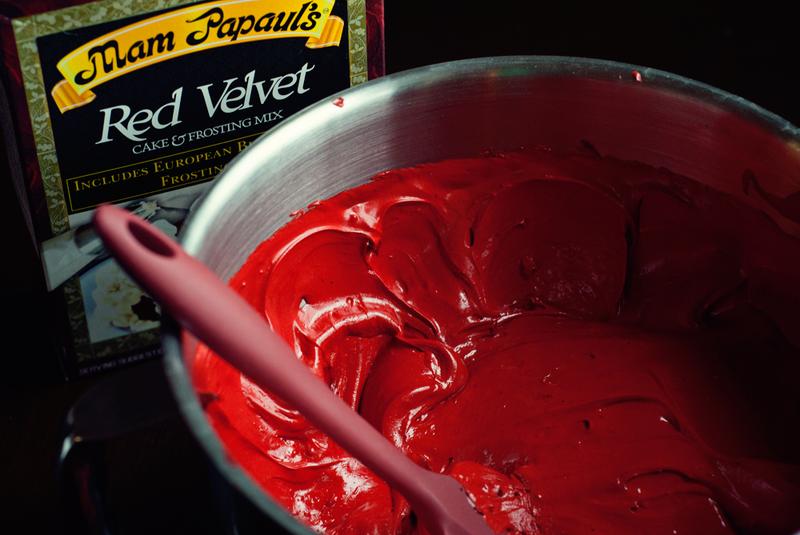 When I originally set out to do this cake, I knew I would need more time to work with the decorating, so instead of using my original red velvet recipe, I decided to try out Mam Papaul’s Red Velvet Cake mix. Back when I first created my red velvet recipe, you couldn’t find a box cake anywhere, but now, it’s easy! So I thought I would see how they compare, and honestly, Mam Papaul’s isn’t bad at all! It’s rich, vibrant, and totally sponge-y! And there is enough batter for four, 6 inch rounds, so score on that for sure. 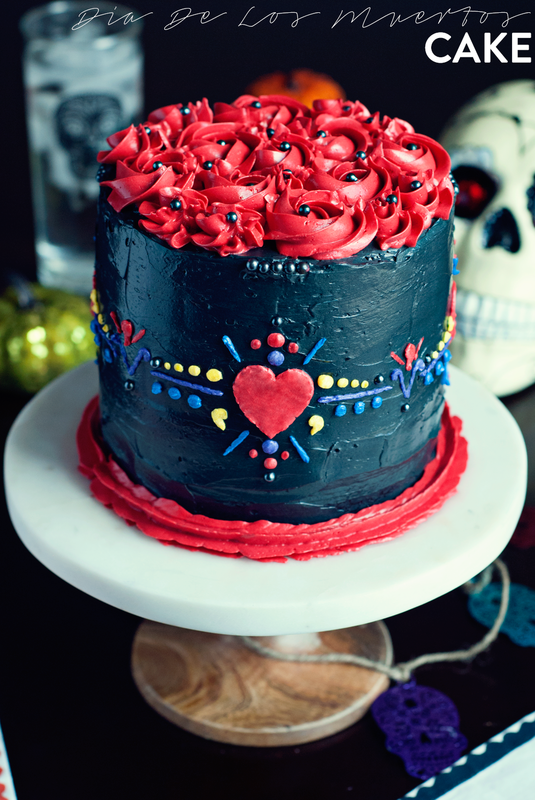 How perfect is a red velvet cake for Dia De Los Muertos? I mean, seriously. Duh. Perfection. Manolo (voiced by Diego Luna) is a young matador who wants to shed the expectations of his family to follow his dreams of being a musician and his best friend, Joaquin (Channing Tatum), is the successful pride of the town. They compete for the heart of Maria (Zoe Saldana). In order to win Maria’s heart and save her life, Manolo must face his greatest fears and follow his heart to rewrite his destiny. I went with Swiss meringue buttercream for this cake because of how satiny, shiny, and smooth it is, which is why my cake looks almost metallic black (awesome, right?). It’s a little time-consuming to make, but worth it. It’s a frosting you will return to again and again because it’s so forgiving and easy to make, and it stores like a dream as well. 1| Be sure to wipe down everything (bowls, whisks, paddles, spatulas) with vinegar or lemon juice to remove all traces of grease. Grease is the enemy of meringue and will kill it with the quickness. 2| You don’t want the butter to be cold, or warm, but cool. I cut the butter up and put them in a few bowls, taking them out of the fridge every few minutes so they can warm up just slightly. If the butter is too warm, the whole thing will get soupy and you’ll have to put the entire bowl in the fridge to get it to stiffen back up. 3| You may find your buttercream develops a lumpy consistency, or grainy. This is normal, I promise. Just keep on whipping and adding butter, and it will begin to smooth back out in a few minutes. Tinting buttercream black is hard work, y’all. 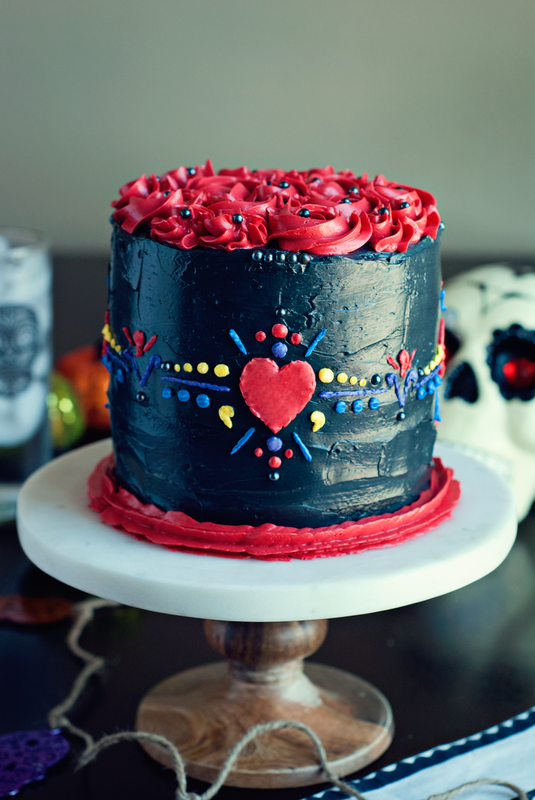 I used an entire container of black food color gel to get this right, but it’s worth it, cause I mean, how amazing does this Dia De Los Muertos cake look? You can grab all your Halloween decor, like that awesome jeweled sugar skull in my photos at World Market! Following the instructions on the box, prep the cake mix as directed. Grease and flour two 6-inch rounds, then fill halfway with batter and bake for 25-30 minutes at 350 degrees. Combine the egg whites and sugar in the bowl of a mixer and place it over a pot with one inch of simmering water, gently whisking until the temperature reaches 160 degrees on a candy thermometer, or until the sugar has completely dissolved and the egg whites are hot. With the whisk attachment, beat the mixture on medium-high for a good ten minutes, or until the bowl has completely cooled down. Switching to the paddle attachment on low speed, begin adding butter, a couple tabs at a time, and allow to mix for several seconds before adding more. Continue until all the butter is gone and the buttercream is smooth and shiny. Add the vanilla and salt and beat a few more times. 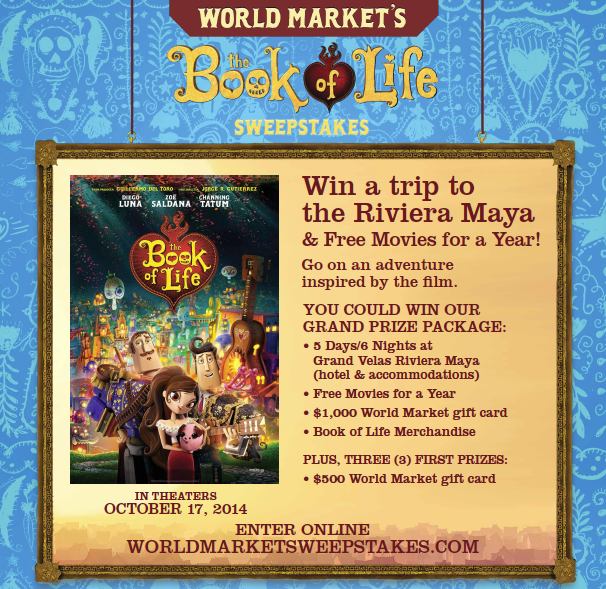 • You could win a trip to the Riviera Maya & FREE Movies for a Year! 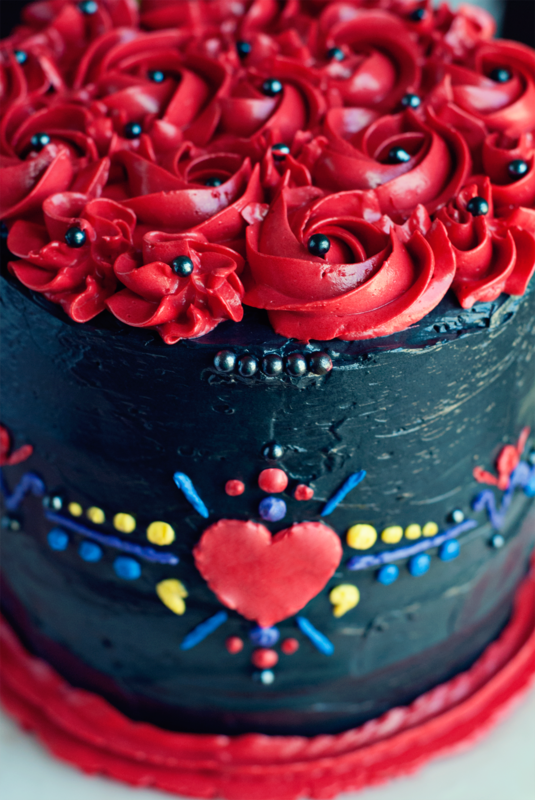 This cake is gorgeous and it looks delicious! I've been looking for some new ideas for more "grownup" Halloween desserts and this is perfect. Thanks for posting it! Just come to my house and cook all my food. kthnksbye. Seriously though, looks delicious! 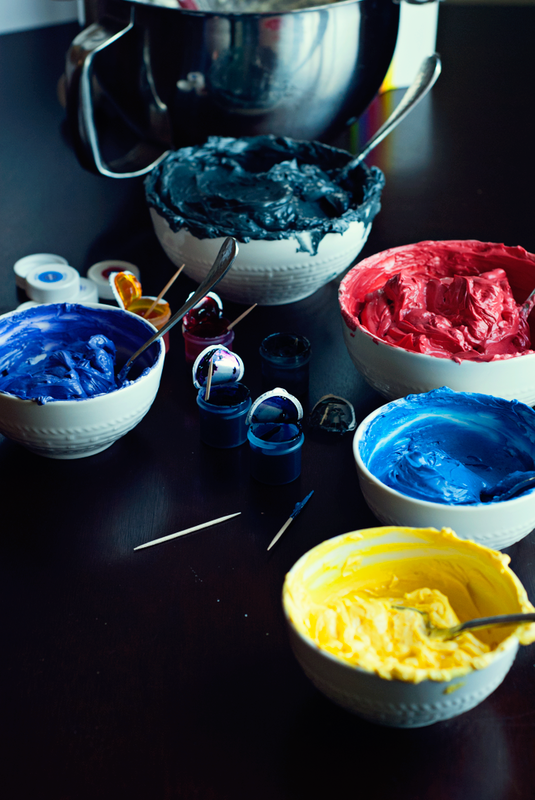 How do you get your Swiss meringue to take such deep colours!!?? You said uou use a contauner of black. Was there a bitter aftertaste?